The Big 12 Conference released its 90-game 2016-17 men's basketball schedule Thursday, completing Oklahoma's slate for the upcoming season. The Sooners will begin their league schedule at home against Baylor on Friday, Dec. 30, and will have all 18 of their conference games televised nationally on an ESPN network. 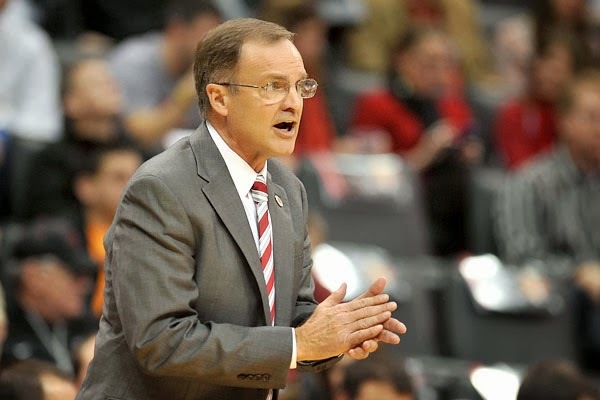 Head coach Lon Kruger's Sooners will play their other eight league home games Jan. 10 vs. Kansas (ESPN2), Jan. 14 vs. Texas Tech (ESPNU), Jan. 21 vs. Iowa State (ESPN or ESPN2), Jan. 30 vs. Oklahoma State (ESPN Big Monday), Feb. 8 vs. West Virginia (ESPN2), Feb. 14 vs. Texas (ESPN2), Feb. 25 vs. Kansas State (ESPNU) and March 4 vs. TCU (ESPNEWS). OU will play its nine road games Jan. 3 at TCU (ESPNU), Jan. 7 at Kansas State (ESPNEWS), Jan. 18 at West Virginia (ESPN2), Jan. 23 at Texas (ESPN Big Monday), Feb. 4 at Texas Tech (ESPNU), Feb. 11 at Iowa State (ESPN2), Feb. 18 at Oklahoma State (ESPNU), Feb. 21 at Baylor (ESPN2) and Feb. 27 at Kansas (ESPN Big Monday). The Phillips 66 Big 12 Men's Basketball Championship will be played March 8-11 (Wednesday-Saturday) at Sprint Center in Kansas City, Mo. Of the Big 12's 90 league contests in 2016-17, 85 matchups (94.4 percent) will be seen on a national platform - ESPN, ESPN2, ESPNU, ESPNEWS or CBS Sports. The televised conference games are being carried as part of a multi-year agreement with ESPN that runs through the 2024-25 season. The Big 12 is coming off its third straight campaign of sending a nation-leading seven teams to the NCAA Tournament. Last season, five of those seven teams were seeded fifth or better in the tournament, the most of any conference. The announcement of the conference contests completes Oklahoma's 2016-17 season schedule. The Sooners will open the regular season on Nov. 13 by hosting Northwestern State. OU's non-conference play is highlighted by home games against Memphis (Dec. 17) and Florida (Jan. 28), a meeting with Wichita State at Chesapeake Energy Arena (Dec. 10) and a road contest against Wisconsin (Dec. 3). The Sooners will also participate in the Puerto Rico Classic in San Juan, P.R., (Nov. 17-20). OU is coming off its fifth trip to the NCAA Final Four and its fourth straight NCAA Tournament appearance. The Sooners return starting guard Jordan Woodard, a senior, and starting forward Khadeem Lattin, a junior. OU's entire 2016-17 schedule appears below. Dates and times are subject to change.Season tickets are now on sale here. For additional ticket information, contact the OU Athletics Ticket Office by phone at (800) 456-4668 or by email at outickets@ou.edu.